patient in need of life-long treatment. What is the Cost of Measuring a Blood Pressure? Rationale: Blood Pressure measurement has transitioned to the oscillometric method in most hospitals in the United States, however out-patient offi ces mainly use the auscultatory technique. Hypertension is the medical condition for having persistently high blood pressure, when our heart has to work harder to push blood around our body. The prime aim of Annals of Clinical Hypertension is to publish research stuffs promoting a healthy lifestyle and preventive strategies to decrease the prevalence of hypertension in the general population. 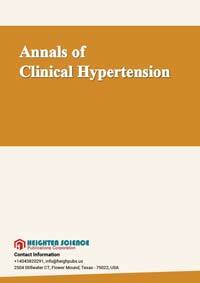 The scope of Annals of Clinical Hypertension proffers in disseminating latest information, thoughts and reviews on all the aspects related to hypertension disease. Hypertension is one of the most common worldwide diseases afflicting humans and is a major risk factor for strokes, myocardial infarctions, vascular diseases and chronic kidney diseases.